It would be a mistake to read these rules as applicable to only “monks.” Too often we speak as if there are different spiritualities according to one’s state of life – lay, married, single, celibate, priest, monk. The truth is there is only one spirituality, that of the Gospel According to our Lord Jesus Christ. So it should be no surprise that these “seven rules of a monk” sound very familiar. They describe gospel spirituality. They are the rules we are each called to live regardless of our station in life. While we may distinguish the various external and changeable forms in, by, and through which our spirituality is lived and expressed, the inner principle, the gospel, remains permanent and universal. The English word “monk” is derived from the Greek μοναχός, monachos, meaning single, solitary, or alone. At one level we might understand this as a physical aloneness or solitariness. That is, however, simply to view the external form of monasticism. The deeper and perhaps truer meaning of monk is the one who is alone with God. That aloneness with God can take place regardless of the external circumstances of our life. In fact, that aloneness with God is what allows us to be fully present to the people that the external circumstances of our life bring to us. While we may not all be called to the monastic life we are all called to live an interiorized monasticism that is manifested in whatever circumstances we find ourselves – at home with family, in the parish, our day-to-day work, business transactions, in school whether as teacher or student, running errands, at the grocery store, the car pool, in times of rest and recreation. 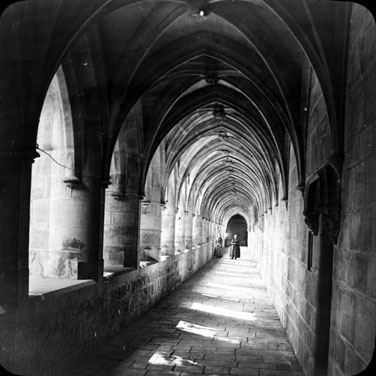 The monastic state is normative for every soul, it is essentially the coming of the Kingdom to the depth of the heart and the trembling of the soul (humility) before the gate of heaven. I found these beautiful gospel precepts on the “Interrupting the Silence” blog by Father Michael K. Marsh, and they really summed up my philosophy about how to live in a Christlike way. These rules are not just useful for monks, but for anyone trying to imitate Christ. A wonderful post here by Interrupting The Silence. ‘The deeper and truer meaning of a monk is the one who is alone with God’. Very evocative. Thanks for reblogging this post Jill. I had not read it in a while and it was good to be reminded of our truest vocation.